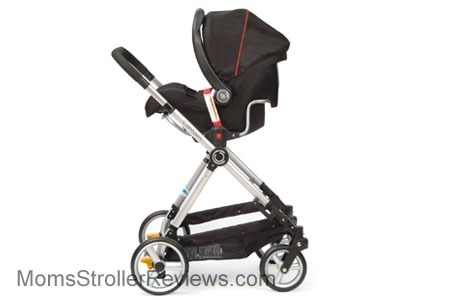 Contours Bliss 4-in-1 Stroller System is the most expensive model in Contours line. This luxury stroller is absolutely amazing! It converts from infant car seat carrier, to pram, to take away carrycot, to a stroller – all in one piece. Since the seat transforms into a carrycot, you don’t even need to purchase a separate bassinet (unlike many other strollers with a bassinet option). I really like that you can bring the carrycot inside of the house without waking up the baby and use it as another sleeping place. The seat is also reversible and comes with an insert that will provide your newborn with extra support. The Bliss designed for everyday use like taking a walk in the park, grocery shopping, or going to the mall. A large basket will fit a lot of groceries while never-flat tires with front wheel suspension will provide your little one with a smooth ride. Although it’s not an all-terrain stroller, the wheels are large enough to tackle some mommy terrain like grass, mulch or gravel. The Bliss also features a large canopy, adjustable handle bar, flip-flop friendly brake and easy fold. While it does not have the most compact fold, you can make it less bulky by removing the wheels and the seat. All this goodness weighs 24.8 lbs which is average for a full size stroller. I gave it 4 out of 5 stars because I absolutely love the reversible seat, flat-bed option, great canopy, and large basket. There is almost a perfect stroller, but as always I have a few things I would like to change. I would like to see a second leg rest for older children and a higher weight limit. This puppy is not cheap. It retails for around $399 on Amazon (free shipping/free returns and no tax). The good news is that it comes with multiple accessories like cup holder, swing-away bumper bar, footmuff and infant car seat adapter that is compatible with over 20 most popular car seats. It comes only in two colors. -Large canopy. The canopy is a great size. It goes all the way down to the bumper bar providing your child with full sun protection. In the back, the canopy is attached to the seat and does not convert into a follow-the-sun canopy. It has a small plastic peekaboo window with a velcro closure. I really like the cool print inside of the canopy. -Reversible seat. The seat is very roomy and it has one-hand lever recline. There are three recline positions including a flat one. The cool thing about this seat is that you don’t need to use both hands to reverse it. You can hold a baby with one hand and reverse the seat with the other. To reverse the seat, take the baby out of the stroller, with one hand push a yellow button on each side of the seat. Next, lift the seat up using the bumper bar, swing it around and slide it into the frame until you hear a click. That’s it. The seat can hold a child from birth and up to 40 lbs. -Flat-bed. This seat can easily convert into a flat bed for a newborn. All you need to do is fully recline the seat and squeeze two clips at the bottom. Push the seat down till it’s flat. The unique feature of this pram is that it is positioned under a slight angle, so your baby is not completely flat. Inside of the pram, there is an infant insert, that has extra padding on the sides. This will provide your newborn with extra support and comfort. There are holes in the padding made specially for the harness. Once your baby is older, you can simply remove the seat liner. The flat-bed can be also used as a carrycot around the house. I love that I don’t have to wake sleeping baby when done with a walk. I can just unsnap the bassinet and take it home with you. Nice! BTW, the bumper bar is used as a handle to carry the carrycot. -Bumper bar. INCLUDED! It comes with a swing-away removable bumper that is covered with the same material as the seat so your child will not get a mouth full of foam if he/she decides to take a bite. -5 point harness. It has an adjustable padded 5 point harness with a double buckle in the middle. The shoulder straps have small hooks that attach to the waist belt. The buckle is hard to unlock so your toddler will not be able to escape. -Two pockets. There are two storage pockets inside of the seat where you can store snacks, bottle or toys for your child. -Car seat adapter. INCLUDED! 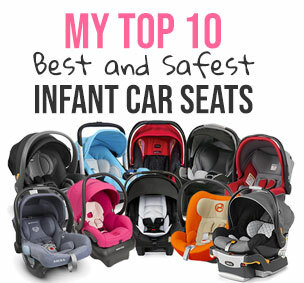 It comes with an infant car seat adapter that fits over 20 most popular car seats. It snaps right into a frame. Great way to transport your newborn. -Telescoping handle bar. The handle bar adjusts from 39″ to 42″ from the ground. Great for shorter and taller parents. -Cup holder. INCLUDED! This cup holder is expandable and can hold drinks of any size. -Large basket. The basket is very large. You will be able to fit a large diaper bag with some room to spare. It’s also very easy to access from all the sides. When I go grocery shopping, I prefer having my daughter in the stroller instead of a dirty shopping cart. But the basket has to be large and easy to access, otherwise I would be able to get all the items I need. -Wheels. It rolls on four never-flat wheels with 10″ wheels in the back and 8″ in the front. The front wheels are swivel, but can be locked straight if the terrain gets rough. -Front-wheel suspension. There is a front wheel suspension system that helps to absorb some of the bumps. -Parking brake. There is a foot brake located between rear wheels. To lock them, push the lever down with your foot. To unlock the wheels, push the back bar forward. It’s flip-flop friendly! -Easy fold. You will need to use both hands to fold it. To fold the stroller, pull on the levers located on both sides of the stroller and it will fold down. You can fold the stroller wit the seat on, but it needs to be in a forward-facing position. There is an automatic lock, but it doesn’t have a free-standing fold. For more compact fold, you can remove the front wheels and the seat. It’s not very compact stroller since the seat doesn’t fold. The folded dimensions with the seat attached are 24.5″ H x 23″ W x 37.5″ L.
-Bulky. Most strollers with the reversible seat are bulky. Since the seat doesn’t fold, and sits on top of the folded frame, it takes up more space. -Low weight limit. Some strollers can accommodate a child up to 75 lbs. That’s probably around the time when they go to college… LOL. But really, 40 lbs is not that much. -Short foot rest. The leg drop is kind of short. Many strollers have two leg rests: one that is part of the seat for younger children and one that is part of the frame for older kids. Since Bliss has only one foot rest, your child will probably grow out of it pretty quickly. Here is a great review I found on YouTube. Here is video overview from Contours. Take a look. Contours has a one-year warranty on the frame of the stroller and 1 year on small parts and fabric. Here is more information on the warranty. For 2013 this stroller is available in two color combinations: Valencia (gray/yellow) and Wilshire (gray/black). My favorite place to buy strollers and a lot of other baby items is Amazon. It usually has the lowest prices, free shipping, free returns and no sales tax. How great is that? You can get Contours Bliss 4-in-1 in one of the two beautiful colors for around $399 on Amazon (free shipping/free return and no sales tax). It comes with multiple accessories like cup holder, swing-away bumper bar, footmuff and infant car seat adapter that is compatible with over 20 most popular car seats. Hey, could this stroller use a gliding board? I have a three year old that doesn’t need to be in a stroller (no double), but it would be nice if she could hop on while at the zoo and such? Can this be used for jogging? I have a 6 month old who just now started sitting up by himself. We go to a lot of children sport activities because of my other son who is 7. I thinking the flat bed would be good for my 6 month old to sit up in and watch the “big boys” play baseball while playing with his own toys without me having to hold him the whole time…he is 18lbs. And not to mention all the other accesibilities this specific stroller has. So my question is, would this flat bed position be able to act as a little play pen for my 6 month old and of course i will be directly beside the stroller. Do you happen to know the length of the foot rest? And is the length from seat to canopy measured just along the back of the seat or is it measured from the bottom of the seat to the top of the canopy while extended?